All of the major animal welfare and protection groups in Europe got behind the comprehensive ADI proposals, and the next phase of this campaign was on. By the end of 2008 the European Parliament had appointed the MEPs responsible for the draft Directive in three Committees: Neil Parish (UK, Conservative) as main rapporteur in the Agriculture Committee, Mojca Drcar Murko (Slovenia, Liberal) as co-rapporteur in the Environment Committee and Esko Seppänen (Finland, Nordic Green Left) as co-rapporteur in the Industry Committee. 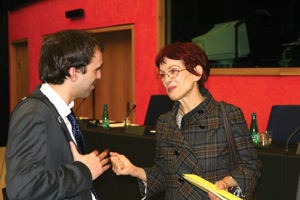 We were particularly pleased with the appointment of Mojca Drcar Murko MEP, one of the most active sponsors of Written Declaration 40 against primate experiments, and had hoped for a positive impact by Neil Parish MEP, who also signed the Declaration and was President of the Intergroup for Animal Welfare. 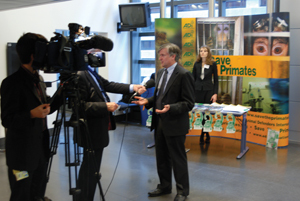 Before the Committee work started, we organised the launch of the Save the Primates campaign in Strasbourg, with the support of high-profile MEPs such as David Martin (UK, Labour), Jens Holm (Sweden, Nordic Green Left) and Carl Schlyter (Sweden, Greens). ADI’s shocking new documentary featuring undercover footage at primate supplier Nafovanny in Vietnam, wild capture in South America and experiments at Huntingdon Life Sciences in the UK revealed every aspect of the suffering of laboratory primates. We provided detailed proposals and suggestions for amendments to all Committee members. Mojca Drcar Murko presented a progressive report in Environment Committee that would improve the Commission’s text. However, MEPs heavily lobbied by pro-vivisection industries contributed to derail Ms Murko’s report. The most shameful attacks came from Caroline Jackson MEP, a British Conservative who claimed that research would go abroad if standards were raised in Europe, and that ending primate experiments would leave patients suffering with Parkinson and Alzheimer without cures. Ms Jackson provided no evidence to substantiate her claims, but the trick worked and a frightened Environment Committee rejected most of Ms Murko’s amendments. This was helped by a low attendance for the vote. Ms Murko, appalled that the debate on this highly important issue was replaced by blatant scaremongering and hysteria from primate trade and pharmaceutical lobbyists – with the help of MEPs Caroline Jackson and Francoise Grossetete – eventually disowned the report and resigned as rapporteur. This was an unexpected outcome since the Environment Committee is usually an arena friendly to animal protection and positive about replacements. This defeat undoubtedly reflected the huge amount of resources that the pharmaceutical companies had invested to destroy the Commission’s text in a huge lobbying effort – there were easily ten industry lobbyists to every one of ours. The vote in Industry Committee was also disappointing, despite the efforts of former Polish Prime Minister Jerzy Buzek MEP (EPP) and David Hammerstein MEP (Spain, Greens) to prevent industry dismantling measures to bring in proper regulation, protect animals, and introduce advanced alternative techniques. Our education drive to counter some of the industry propaganda was therefore vital. However, the biggest disappointment came from Neil Parish MEP, who proposed a battery of pro-industry amendments to the Agriculture Committee that would, effectively, send EU legislation back to the dark ages. The Chairman of the Intergroup for Animal Welfare decided to grant the wishes of those who did not want to make any effort to replace animal testing. Some of his most regressive amendments included deleting the Commission’s proposal for an end to the capture of wild-caught primates to stock lab breeding farms (see p12-15); astonishingly, scrapping the upper limit of pain; even removing the prior authorisation requirement for 95% of animal testing (mild and moderate experiments). Apparently responding to the industry-generated hysteria that research would end and jobs would be driven abroad, Mr Parish decided to set EU standards far below UK standards. LDF grant holders, neuroscientist Professor Paul Furlong and education expert Professor David Dewhurst joined us in Brussels for one-on-one meetings with MEPs, to provide the perspective of scientists not using animals. In order to counter the misinformation and scaremongering sweeping the Parliament, ADI undertook a huge lobbying effort to meet with every MEP and explain the facts. The key scare stories were that: (a) stronger regulation would overburden science and industry with bureaucracy, resulting in work going abroad and job losses, even halt the search for cures and (b) any move to phase out the use of wild-caught primates would result in more killing and suffering of primates! We produced a briefing on the ‘Competitiveness of European Science and Industry’, showing economic data supporting the case for strong regulation of science and industry. For example, two of the countries with the most comprehensive regulation, the UK and Switzerland, both have hugely successful pharmaceutical industries. In fact, the UK pharmaceutical industry’s trade balance has improved 360% in the 23 years since the UK legislation implementing Directive 86/609. Thus, it is clear that science and industry flourish in a strong regulatory environment with encouragement of new techniques to replace animal use. Another technical briefing ‘Ending the trapping of wild monkeys for research and breeding’ supported the Commission’s impact assessment of their proposed seven-year phase-out of primates born of wild-caught parents. It demonstrated the conservation, environment, welfare and scientific impacts of using animals caught from the wild, and dismissed the nonsense from those with a vested interest in the primate trade. The very negative Parish report triggered strong opposition from the Alliance of the Liberals and Democrats (ALDE), and in particular Jorgo Chatzimarkakis MEP (Germany, Liberal), who argued against it in the Agriculture Committee hearings. The Greens also tabled good amendments. However, the bulk of the report was eventually adopted (although with some some good amendments), because of a consensus between the two main political groups (PES and EPP). It is disappointing that there were more industry lobbyists attending the Committee meeting than MEPs – very few actually cast their vote on this issue, despite the huge concerns of the public reflected by the postcards, letters and telephone calls from our supporters. The good news in the Agriculture Committee was that Neil Parish backed several commitments to improve funding and development of alternatives and also bi-annual thematic review. For example, the MEPs adopted our amendments to regularly review the use of primates (tabled by British Labour MEP Brian Simpson with Dutch MEP Lily Jacobs); biannual reviews of the use of specific species and specific tests; a review of the whole directive every five years; and new arrangements to help make a European Centre of Excellence with centres in each EU Member State, to promote, develop, and validate advanced replacement techniques. Member States were also asked to financially support the development of alternatives. Sadly, at the same time animal protection measures in the Commission’s proposal were almost universally weakened, and the mechanisms that might have actually ensured implementation of alternatives, such as prior authorisation of all experiments, were scrapped. We were now campaigning more intensely than ever to ensure the positive amendments we had secured, such as thematic review, did not lose support, and the most destructive amendments were not passed by Plenary. Of the latter, we had a fight to overturn the removal of prior authorisation all experiments except for primate and severe experiments; this would mean no prior ethical/scientific scrutiny and consideration of alternatives for over 95% of animal experiments across the EU. After intense discussions, an amendment requiring prior authorisation for experiments of ‘moderate’ suffering was tabled. The most intense area of lobbying from industry had been to overturn the phase out of wild-caught monkeys in breeding centres. They have fought tooth and nail to maintain this unethical supply of cheap monkeys and to hell with the welfare cost. In the end MEPs buckled under industry pressure and the phase out has been delayed indefinitely with a “feasibility study”. A reasonable proposal from the Liberals to adopt the seven year phase out but review the deadline after three years was not supported at the final vote. We kept campaigning right to the end. It was bank holiday weekend in the UK, but most of the ADI London office kept working. For the final push, an ADI team of eight flew out to Strasbourg on Sunday – for most Strasbourg and Brussels have become second homes the past four months! We were joined by our volunteers and had speakers in English, French, Finnish, German, Greek and Portuguese. A key element of our campaign has been to aim to communicate as directly and immediately as possible, indeed a large expense of this campaign has been the high level of translation work. At the Parliament the following morning we distributed information, met with MEPs and advisors (almost 100 meetings by the end of the day). As with every Parliamentary session of the campaign, we had a new range of materials: a briefing outlining all the amendments on primate experiments and why they should be supported or opposed; a leaflet on the amendments; and a 30-page commentary on each of the 202 amendments now before Plenary. A team of vivisectionists from a coalition of French laboratories was distributing a glossy brochure in French and English, extolling vivisection; this also reiterated the claims that research would end if MEPs regulated it, and that if dealers could not take monkeys from the wild they would trap even more! We had packed lunches so that we could work without stopping. The Plenary debate took place after 10pm. Neil Parish’s report was strongly challenged by Caroline Lucas MEP (UK, Greens), Jorgo Chatzimarkakis MEP and Kartika Liotard MEP. Others backed it. Environment Commissioner Dimas defended the Commission’s proposals and also, as did Neil Parish, singled out thematic review as a progressive measure – we have clearly won consensus on this proposal. At midnight, we put a door hanger on every MEP’s door calling on them to vote “yes” to science but “no” to suffering. At 1am we were back at our hotel, a short sleep, 7am breakfast meeting, and into the Parliament at 8.30am. As the MEPs went into Plenary they passed our information stand. In the early afternoon they voted. The final outcome of the vote is a mixed bag, with some good amendments (bi-annual reviews to target specific tests and use of specific species, expansion of ECVAM and implementation of replacements). The terrible amendment allowing severe and prolonged suffering was overturned. But the Commisison proposal was badly damaged in certain areas – prior authorisation was cut from over 4 million ‘mild’ category experiments and the phase out of wild capture of primates by lab dealers was lost. The Greens and Liberals took a progressive line, the dominant PES (Socialists) and the EPP (Conservatives) supported the Parish report. Although the UK’s Animals (Scientific Procedures) Act 1986 went further than Directive 86/609, introducing some key regulatory mechanisms, its success in improving animal welfare, implementation of alternatives, and elimination of duplication has been limited, and it has failed to reduce levels of animal use. It had been hoped that the new EU Directive would raise the bar, addressing the failings of the 1986 Act and raise standards in the UK and the rest of Europe. In the end MEPs were spooked by the blackmail from industry and voted for proposals which fall a long way short of what has been in place in the UK and several other Member States for years. We had hoped for more, but perhaps most importantly we prevented what might have been a complete meltdown of regulation of the science industry and protection of animals across the European Union. The Directive will now go to the Council of Ministers, where every Member State will have its say on the Commission’s proposal and on the European Parliament’s amendments. The Directive can only be adopted if both the Council and the Parliament agree on the same text. The Commission would play an important conciliatory role if the two institutions were to disagree. Now we must focus on the Council of Ministers, under Swedish Presidency from July 2009, and convince them not to accept the most damaging amendments. We are already meeting with the UK Home Office and are gearing up Europe-wide campaigns. We will also be continuing discussions with and providing evidence to the Commission. We hope that, at the end of this process, the Council of Ministers will present a better text to the European Parliament for the second Reading in Plenary, which may take place later this year. There is still everything to fight for.